There are two important stories in today’s Times of Malta that need attention and need some connecting as I see it. 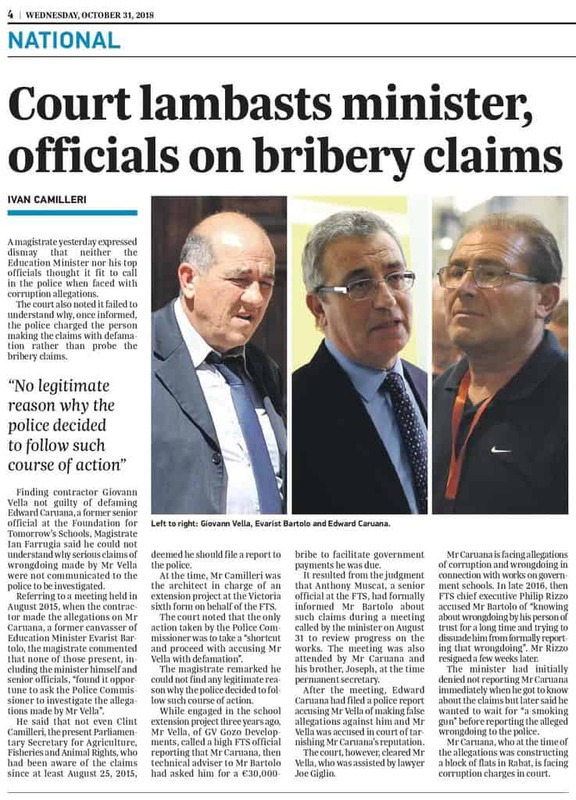 On page 4 of the print edition, there’s Ivan Camilleri’s court report of Magistrate Ian Farrugia criticising Minister Evarist Bartolo for sitting on information of corruption of a member of his staff. It’s the story of his canvasser and staffer Edward Caruana on whom Evarist Bartolo had documented evidence of corruption for near a year and covered it up. Evarist Bartolo is of course still Minister. Magistrate Ian Farrugia also admonished the police who instead of chasing the corrupt official prosecuted the whistleblower who pointed his finger at the corrupt official. So the whistleblower was dragged through the courts but the Minister who employed, protected and covered up for the corrupt official is unaffected by this. The Magistrate also named Clint Camilleri, now a junior Minister and at the time the claims of corruption were first made an architect involved in one of the projects tainted by corruption. It should be clear to everyone greedy, corrupt people like Edward Caruana will pop up under any administration in any political culture. But the unique problem we have here is politicians are covering up for their corrupt friends and the police are unwilling to touch them. Here’s the story from this morning’s Times of Malta. Now compare this with Ivan Martin’s front page story about two magisterial inquiries into a “tuna racket”. His coverage started Sunday and more details are revealed today including the involvement of an unnamed public officer who appears to have facilitated the corrupt trafficking out at sea. In this case, judging by the details covered in the report, the politicians stopped an administrative decision (to increase tuna quotas by a huge number) when they became aware of it. That’s nice. But did they act on it? Did the police investigate the incident? Was the employee concerned suspended and investigated? Was the public informed its government may have been involved in a corrupt illegal tuna racket worth more than €20 million a year? We found out about this racket because Spanish police are investigating the case and taking action through Spanish authorities. When that happens local authorities have no choice but to react. That’s when it gets to local Magistrates when Malta police carry the mail for the police authorities of other countries. You’ve heard this before: in the case of pilfering from the Venezuelan petroleum monopoly by the family of their dictator there; and of course famously when the FBI put Ali Sadr in handcuffs after moving around Malta like he owned the place. The rot of corruption is at the heart of the administration of the country and the institutions with the responsibility to weed it out are unwilling or unable to take any action.